Why choose Dryshield for your Basement waterproofing? Why basement waterproofing is important? When a building is constructed, the ground is excavated for the installation of the foundation. Concrete footings our poured and the foundation walls are installed. The foundation walls can differ from cinder block concrete to poured concrete, brick or even old field stone. Depending on the type of foundation you have, the appropriate basement waterproofing solution may vary. Once the foundation is installed typically code only requires a spray on damp proof and not proper waterproofing materials. Weeping tiles are then installed around the perimeter on the outside bottom of the footings either connecting to drainage at the front of the house or to a sump pump. Once the drainage and damp proof is applied the excavated ground is back filled. The soil that is back filled is not a dense as the soil around the house that has never been excavated and the new foundation basically sits in a bowl in the ground. When it rains or snow melts, the water will seep into the ground and follow the excavated slope to the bottom of the foundation. The weeping tiles are installed at the bottom side of the footings to drain the water from around the foundation. When the weeping tiles clog or break the water begins to build around the foundation creating hydro-static pressure. When the pressure build the water will eventually seep in typically threw the wall floor joint. 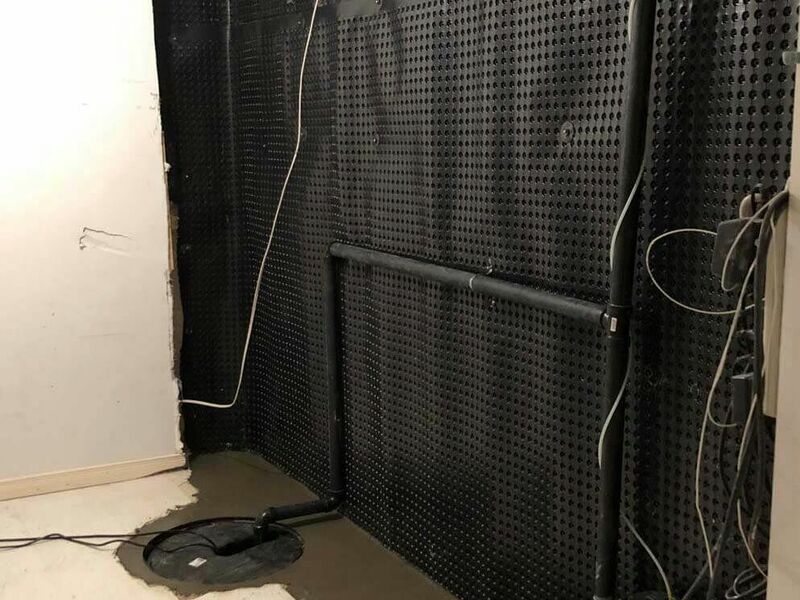 With the lack of proper waterproofing on the foundation walls it is important to make sure proper steps and materials are done for your basement waterproofing to protect your investment. Basement waterproofing is necessary to prevent water seepage that can lead to damage and even cause mold. There’re two solutions for basement waterproofing: the internal drainage system external basement waterproofing. The ground around the foundation is excavated to the bottom of the weeping tiles. The walls and footings are then cleaned and the existing weeping tiles are then removed. A waterproof rubberized urethane is then applied (by hand) on the walls to the bottom side of the footings and covered with poly sheeting. The walls are the sealed with dimple board, the final third membrane and sealed at the top with a nice finishing strip. New plastic weeping tiles wrapped with a geo textile filter cloth are installed. A minimum of 1′ of 3/4″ clear gravel is installed on top of the weeping tiles. The stone is then sealed with a geo textile filter cloth before the soil is back filled to prevent clogging. The soil is then back filled and tamped grading away from the foundation. According to the situation a more cost-efficient technique can be performed from the interior. The most recent techniques consider appropriate internal drainage systems. The solution to seepage is drainage. Our internal method includes exposing the bottom sides of footings on the inside. The concrete is broken roughly 12-14″ from the foundation walls and a trench is dug to the bottom side of the footings. Sometimes the removal of drywall, studs, insulation and flooring is required to gain access. Weeping tiles with a filter cloth are then laid graded towards existing drainage or a new sump pump that will discharge on the exterior of house. 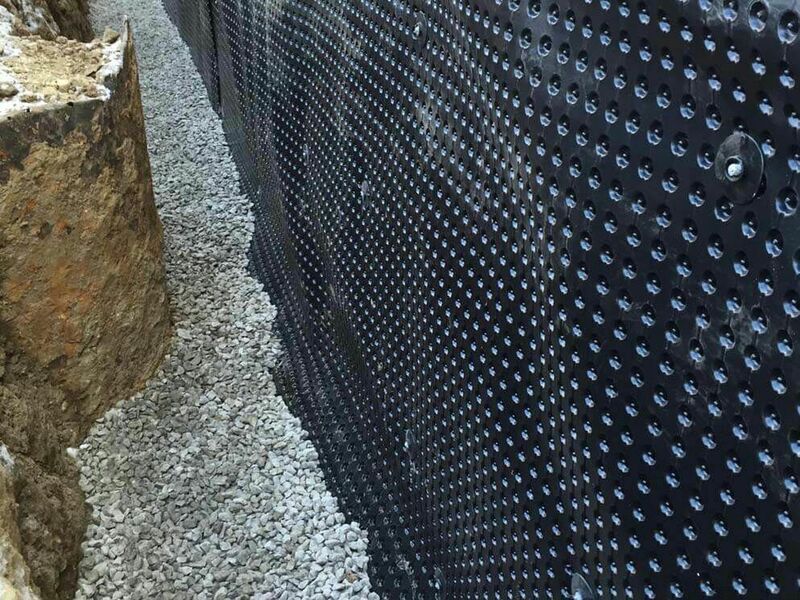 The weeping tiles are then covered with 3/4″ clear stone and topped with dimple board extending up the foundation wall to a minimum of 2′. New concrete is then poured back level with the existing floor and the work area is cleaned. DryShield is the forerunner on innovative waterproofing solutions. Our FREE online Estimate Tool is a perfect example. This quoting tool lets you obtain a quote for your residential or commercial waterproofing project. This feature enables you to access our services online for free from anywhere at any time. DryShield has an unparalleled record for customer satisfaction for more than 25 years. We are always ready to assist you. Call us at 1-800-277-5411 to know about our services, solutions or for a free basement waterproofing toronto quote. You can also try our free online estimate tool.